More than 100 assisted living residents have packed their things and moved out of the Carlyle Care Center, as Pioneer Human Services transitions the facility at Post and Second to affordable housing. About six months ago, the 107 residents then living at the center, which could sleep up to 127, were told that the facility would stop serving folks with chronic mental illness, like them. Their reactions ranged from gleeful to suicidal. Many wondered where they'd end up, especially some who've called the building home since before it was converted to a care facility. Since then, Pioneer has worked with a team of agencies to make sure every resident could get into the right level of care before the end of October, when the facility will officially switch to some type of affordable housing. Pioneer worked with Frontier Behavioral Health and case managers, as well as the state Department of Social and Health Services, to take residents to tour facilities and help them find the best fit. Some residents are moving as far away as Winchester, Idaho, making the switch to an assisted living facility in the town two-and-a-half hours away, just south of Lewiston, says Christine Barada, director of Spokane County's Community Services, Housing and Community Development Department, which also oversees the regional Behavioral Health Organization. "Other people have moved there from the Carlyle in the past and have been really happy," Barada says. About half of the residents moved to the facility in Winchester and another assisted living facility, says Hilary Young, a Pioneer spokeswoman. About a third moved to independent living. A handful will continue living in the Carlyle as independent living, Young says, and everyone else had identified a new place to live as of last week. "One of the positive aspects of the transition is almost everybody moved with their existing roommate or a group of people they knew, so a lot got to keep that sense of that community," Young says. Across the board, the residents moved to about 15 to 20 different locations, Barada says. The city of Spokane and Pioneer each put up at least $10,000 to help with the process, including helping where needed with move-in costs, Barada says. Residents helped through the supportive living program will continue to get checked on over about six months, to make sure they are stabilizing and settling in, she says. Pioneer is currently taking applications from people who want to live in the facility as affordable housing, with an eye on being available for people with criminal histories that face challenges finding landlords willing to rent to them, Young says. The nonprofit plans to rent out about half of the living spaces, none of which have full size fridges or kitchens yet, but all of which have some sort of kitchenette with a microwave and dorm-sized fridge, she says. The other half of the units will be renovated during that time, then those residents will likely get the chance to move into the new units once they're finished so the other half of the building can be updated. 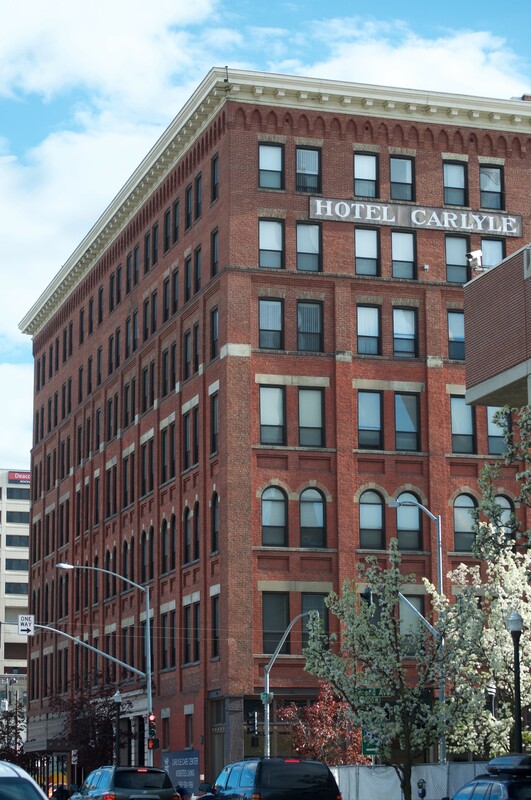 Pioneer's website states the Carlyle has 62 studios and 12 one-bedroom units available, with rent ranging from $535 to $613 a month. A $400 deposit, with $100 not refundable, is also required, as is a $35 background check beforehand, according to the site. "It is affordable housing, so it does target people with lower incomes. Our mission is to work with people who have otherwise been discriminated against because of a criminal record, so we are open access," Young says. "We want to make sure that people understand that that is who it's our mission to serve, and we don't discriminate." The facility won't house people still in custody, but will be staffed 24/7, according to Pioneer. Applicants are asked to turn in their applications in person at the Carlyle between 8 am and 5 pm, any day of the week. To apply, you'll need a photo ID and your Social Security card.